The prestigious Swiss manufacturer of timepieces and jewellery has many distinctive features: remarkable quality, creativity and a successful blend of innovative design, modern technology and traditional craftsmanship. In the sixties, Paul-Andre Chopard, the last watchmaker of that name, was obliged to face the incontrovertible fact: none of his sons wanted to take over the family business. At the same time, Karl Scheufele, a young goldsmith and watchmaker from Pforzheim on the edge of the Black Forest in Germany, was on the lookout for a potential acquisition. The two grandsons of the founders of both companies soon realized that each one had exactly the right profile to suit the other. In 1963, nearly 100 years after the foundation of the Chopard business by Louis-Ulysse, Paul-Andre sold out to Karl Scheufele. The young Scheufele modernised the company and laid the groundwork for a successful luxury business. Paul-Andre Chopard continued to work in the company until his death in 1968. Chopard remains a completely independent family business. Under the management of Karl and Karin Scheufele and their two children, Karl-Friedrich and Caroline, the current co-chairpersons, the internationally renowned company has achieved breathtaking development to become one of the leading names in luxury watches and in the jewellery industry. Caroline is responsible for “luxury jewellery”, design and creation of jewels and ladies timepieces, and also for the fragrances and elegant accessories divisions. She is overseeing the international retail business. Her elder brother, Karl-Friedrich, is in charge of the manufacture in Fleurier where the famous L.U.C. watch movements are developed and made. He is also responsible for the men’s watch division and for all business management aspects. The family council meets regularly to discuss all corporate matters, ranging from strategy to new designs and products. A lively and fruitful exchange of views takes place; sometimes surprises are in store, as on the occasion when Caroline turned up at the meeting with a little bag of pink diamonds. “At the time”, she recalls, “I had an opportunity to buy these rare gemstones at a very favourable price. I had no idea how to use them in our collection of watches and jewellery. But when the bill turned up on my father’s desk, I owed him an explanation”. The pink brilliants were used to make the “La Vie en Rose” line, one of Chopard’s most successful and unusual collections. In the modern production facilities at Pforzheim (Germany) and Meyrin (near Geneva in Switzerland), many different skilled professions are represented, including designers, goldsmiths, polishers, turners, toolmakers, jewellery setters and steel engravers. They work on valuable jewellery pieces and watches with a great love of detail and the utmost precision. “We have direct personal contacts with our staff members”, Karl-Friedrich Scheufele points out, “and we are always available to discuss things with them”. In Chopard’s vertically integrated manufacture – comprising 35 different crafts - all production phases take place in-house, following a chronological order. An in-house training centre proposes apprenticeships in various watch and jewellery related crafts. Design, research and development: This department designs, develops and conceives watch movements, cases and bracelets for new products. A great amount of know-how, creativity and a good sense of innovation are paramount here. Highly specialised technicians, tracers and IT specialists create three-dimensional images. All new products are designed in-house. Preparation of raw materials – Gold melting: Chopard has its own gold melt, unlike most of the companies in the sector, and prepares alloys for white and yellow gold. This means that the entire preparation of raw materials takes place in the Chopard premises in Meyrin. Production of watch cases and bracelets: This domain includes the following profession: precision engineers, stamp makers, case engineers, watch case polishers, to name just a few. Jewellery: The following crafts are represented in the jewellery section: jewellers, specialists in chains, metal engravers, lapidaries, setters, amongst others. Production of movements and watchmaking: Skilled watchmakers can typically manufacture many different parts of a watch. 4 years of training are required to learn this highly specialised craft. Chopard has a «complications» department and many of its mechanical timepieces feature the «Poinçon de Geneve», a reliable gaurantee for quality and excellence as well as the COSC chronometer certificate. With all the above activities under one roof, Chopard bears the prestigious title of a “manufacture”. In 1976, a designer at Chopard had a brilliant idea which did, however, pose a huge technical challenge: the “Happy Diamonds” concept – a watch with diamonds moving freely on the dial. The new design caused a sensation and won the “Golden Rose of Baden-Baden” in the very same year, one of the most highly sought-after prizes for watch design. The “Happy Diamonds” concept went on to become one of Chopard’s most successful collections. The famous drop-shaped motif with arabesques and flower patterns is a distinctive feature of the popular “Casmir” collection by Caroline Gruosi-Scheufele. 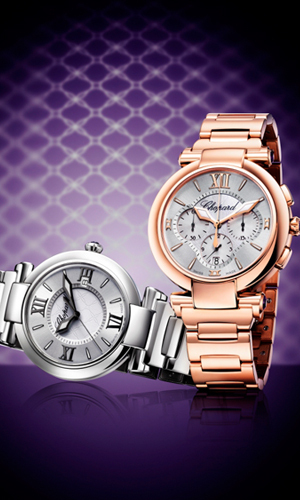 A few years ago, Chopard presented its “Pushkin” collection. On her travels through Russia, Caroline Gruosi-Scheufele drew her inspiration essentially from the golden church domes to design this eminently feminine collection with its elegant and harmonious forms. With “Pushkin”, Chopard created an innovative link between diamonds, pearls and gold. The watches in the “Ice Cube” collection have a square case and are themselves set with diamond squares. The square motif is a typical feature of the jewellery line bearing the same name – a highly understated design which sets off the beauty of the diamonds to best effect. Carnival, samba and idyllic beaches. The “Copacabana” collection is cheerful and colourful like the world’s most famous beach. Arabesques and drop-shaped motifs in lively colours unite the diamonds with the dazzling beauty of rubies and fresh rose and mauve-coloured sapphires. The “Haute Joaillerie” collection of watches and gems is timeless. The watches are richly ornamented with diamonds or precious gemstones. Fantasy and flair are evident in both the classical and modern models, implemented using the very latest technology. The splendid jewellery pieces exert an irresistible fascination and underscore the personal charisma and charm of the lady who wears them. Every piece is a unique masterpiece. Chopard also supplies a wide range of accessories: eyewear, exclusive fragrances, silk foulards and precious porcelain - available from all Chopard boutiques and corners.